I had the opportunity to interview author Alvaro Zinos-Amaro recently about his book Traveler of Worlds. Traveler is a special book, in my opinion, because it's the testament and story of a science fiction great, Robert Silverberg, put forth by someone who is truly connected to him, who has worked with him, and who has talked with the man extensively. George RR Martin had some wonderful things to say about the book on his "not a blog," in his column about Hugo nominations for Related Work (Traveler is currently eligible for Hugo nomination for Best Related Work as well as the Locus Award). So let's hear what Alvaro has to say about Traveler of Worlds! Tell us a little about what gave you the idea for Traveler of Worlds. Alvaro Zinos-Amaro: I've always enjoyed reading books of conversations or interviews, in and out of science fiction. I also knew that Bob Silverberg, at the time entering his eighties, wouldn't write an autobiography, though surely there existed a readership for one. After many a marathon conversation in his living room, I realized there were subjects--travel, gardening, painting, movies, classical music--that he had pursued in a serious way for decades but had hardly written about. What a treasure-trove of experiences, opinions and anecdotes! Why not explore it all somewhat systematically and turn it into a book? Silverberg's professional career is also long-spanning--he started publishing professionally in the 50s--so I thought it would be fun to set down events as a kind of primary historical record. Who might enjoy reading this book? If someone never heard of Robert Silverberg, why might they be tempted to pick it up? Alvaro: George R. R. Martin may have answered your first question, when he said, "If you have any interest at all in writing, the history of the genre, Silverberg's own life, the classics of literature, the greats of our field both living and dead, there's something for you here." Who am I to disagree? Lawrence Block wrote that "you don't need to care about science fiction—I don't, especially—but what RS has to say about reading and writing and the writer's life and travel and food and, yes, aging and mortality and the passage of time is riveting, thought-provoking, and hugely satisfying." Again, who am I to disagree? Silverberg was described by another reviewer of the book, in Locus, as "sophisticated, widely-traveled and -read, ferociously intelligent," so even if you have never heard of him, you might find what he has to say of interest. You've worked with Robert Silverberg on fiction in the past. Can you tell us a little about what that was like? Alvaro: When the Blue Shift Comes involved my writing a novella that would wrap up a story kicked off in a novella by Bob, which he in turn based on an unfinished novel. When I was offered the assignment, I jumped at the chance. After reading his half of the book, I sent him my proposed outline for the second half, and asked where he'd intended to take the novel. After all, he sets in motion the destruction of the entire Universe, so I was curious as to his original resolution. "I won't send you my outline after all, because it will only confuse and distract you," he replied. "You have a fine story of your own to tell here, and have no need of the blind alleys and false trails I went wandering into." He wished me good luck and that, as they say, was that. The two things I focused on most during the writing were approximating the somewhat over-the-top voice of his novella, and making my plot hinge on a fairly abstract concept from theoretical physics that I knew he wouldn't have used, to give it my own distinctive stamp. When I was done I sent him a hard copy and was greatly relieved to receive an extremely positive response. You write a lot of essays and reviews about science fiction. Do you find that this impacts the writing of your fiction at all? Alvaro: In a non-specific way, writing nonfiction is helpful simply because it's a form of writing and therefore provides added practice. It can also offer a nice break in the midst of a fiction project, allowing creative expression in a different form while you "refresh" your fiction-generating batteries. Writing to deadline, I would argue, is a useful skill. Writing nonfiction specifically about science fiction has the added benefit, for me, of helping me to clarify my thoughts and positions about the genre, about what works or doesn't for me in a particular story, and why. This "why" can later prove useful when considering how to approach a story or theme, but it's the reading, not the secondary analysis, that's principally informing the writing. What are you working on right now? Anything exciting coming up? Alvaro: The Jan/Feb and March/April issues of Analog had back-to-back collaborative stories by me: "The Shallowest Waves," with Thoraiya Dyer, in the former, "Shakesville," with Adam-Troy Castro, in the latter, just out. Another collaboration with Adam-Troy-Castro, titled "A Touch of Heart," is forthcoming from Lightspeed. Words, the online magazine published my Hex, bought reprint rights to my story "The Obvious Solution," an Asimov-tribute story which I expect will probably appear online in 2017. My story "Morphing" will appear in Blood Business, a crime anthology edited by Mario Acevedo and Josh Viola. I have a few more stories in the pipeline. I plan to continue my monthly film reviews for Words and my monthly book review column for Intergalactic Medicine Show. You'll see articles by me in places like Tor.com. And I'm in the early stages of a novel--more to come on that! 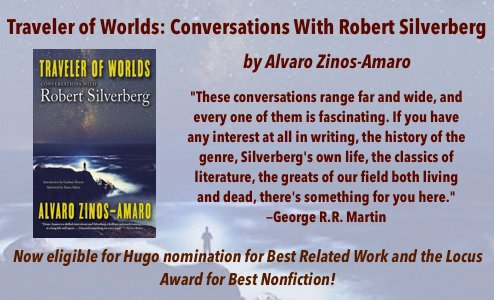 Alvaro Zinos-Amaro is co-author, with Robert Silverberg, of When The Blue Shift Comes and Traveler of Worlds: Conversations with Robert Silverberg, which is currently eligible for Hugo nomination in the Best Related category, and for the Locus Award for nonfiction.